Small vessel vasculitis—inflammation of the small blood vessels—appears as a stain of tiny, red dots covering the skin that, depending on the severity, can evolve into painful pustules or ulcers. In some patients, it may even reflect inflammation in internal organs. Diagnosis usually requites a skin biopsy, which involves cutting a small piece of skin. This can usually be done as an easy bedside procedure, although certain sites, such as areas around the nails and the tips of fingers and toes, or certain patients may be more prone to poor wound healing and complications from the procedure. Adela Rambi G. Cardones, MD, HS'06-'09, associate professor of dermatology, wanted to create a device that could capture an image of at least a centimeter of skin area through a quick, non-invasive process. She wanted to detect the speed, color, and amount of blood flowing through the small blood vessels in order to make a fast, painless, accurate diagnosis. 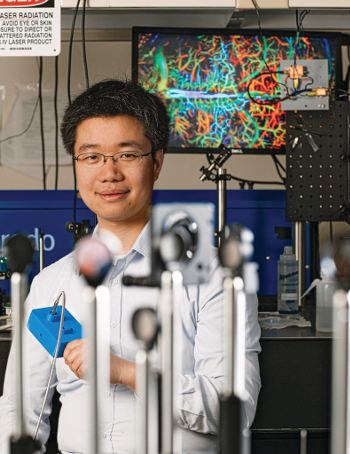 Junjie Yao, PhD, assistant professor of biomedical engineering, develops photoacoustic imaging: the conversion of light beamed through tissue into ultrasound waves that are then analyzed to create high-resolution images. Photoacoustic imaging can reveal a tissue's anatomical, functional, and metabolic properties, with specificity at the molecular and neuronal level. Cardones and Yao teamed up to create a handheld device that could provide high-resolution imaging of the tiny blood vessels in the skin to diagnose vasculitis. One of the key design inspirations came from, of all places, the supermarket. "We were inspired by the handheld devices that scan bar codes in grocery stores," says Yao. "The devices use a polygon mirror and a laser diode to quickly 'read' the product information, and we adapted this concept to build a prototype handheld photoacoustic device to 'read' the skin. We printed a 3D polygon mirror, added a laser and an ultrasound transducer, and then put everything in waterproof frame to detect the emitting ultrasound signals." The lightweight, handheld prototype is about the size of a flashlight. With their photoacoustic imaging device, Cardones and Yao can provide functional sampling of the skin—a photoacoustic biopsy—that clearly identifies the organization and oxygenation of tiny blood vessels in the tissue. With functional imaging of up to 13 mm across and 5 mm in depth, there are numerous other potential applications of their device, such as the study of skin tumors, brain disorders, and eye diseases. Cardones and Yao hope to win IRB approval and begin clinical testing of their device. Beyond that, they see potential for commercialization and will be working with MEDx and the FDA to navigate the process of safety testing and bringing the device to market.